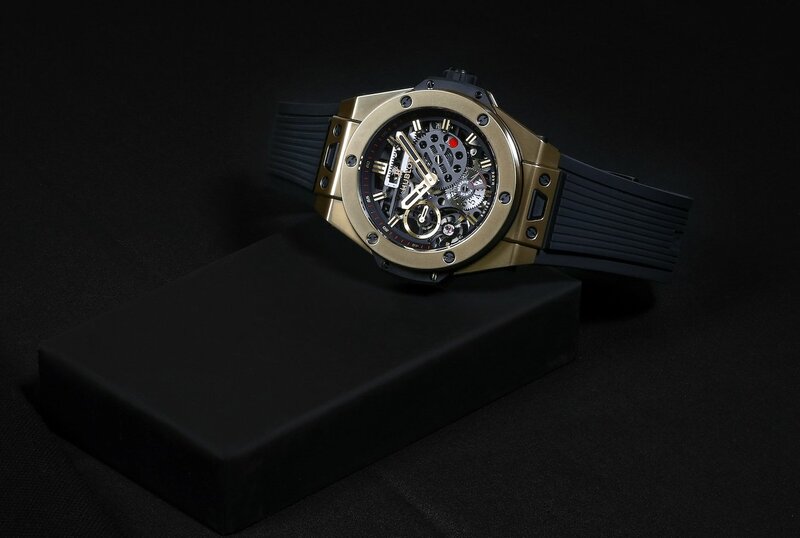 Between its ‘Art of Fusion‘ and being “First, Different and Unique“, Swiss brand Hublot has gotten watch-ers used to one surprise after the other. 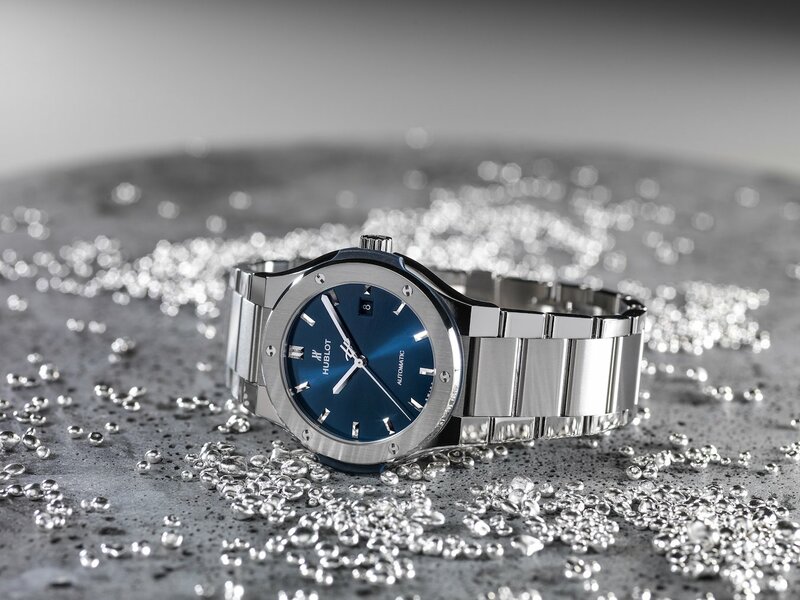 Whether at the beginning of the year at its Geneva Days, at Baselworld every March or throughout the year, the Nyon Manufacture introduces innovative novelties all year round. In a look through the ‘porthole’, here is our pick of the watchmaker’s first novelties of 2017. Hublot reintroduces us to the principles of mechanics last year with the Big Bang Meca-10, a “Meccano” inspired design boasting the brand’s latest Manufacture movement at the time, the HUB1201. Following the All Black and titanium versions, this year we see the Meca-10 in a Magic Gold case, bezel, dial appliques and hands. Developed and patented by Hublot, the indeed magical Magic Gold is the first scratch-resistant gold and the hardest in the world. The latest Meca-10 is a perfect fusion of mechanics, innovation and materials. One of the special features of the Classic Fusion collection is that some of its lines come in five models of four different diameters and a chrono. This year, another five new watches, the Classic Fusion Bracelet Blue, are reinforcing the collection. The five models go from 33, 38 and 42mm, to 45 mm, regular or chronograph with the date at 6 o’clock.Thanks to their shape, sizes, and lovely shade of blue paired with either King Gold or titanium for the case and bracelet, the Bracelet ‘Blues’ adapt to a casual as well as a smart look, and fit both men and women. The King Gold versions don a beautiful shade of Hublot’s “secret” red gold, while the ‘metallic’ reflections of the light, grade-5 titanium gives off an antimagnetic character to the pieces. Women were delighted when Hublot introduced the ingenious One-Click strap changing system with its Big Bang 39mm models, especially when a variety of colored straps emerged last year to adorn the wrists of trendy ladies. Dressed up, dressed down, understated or fancy, no style is difficult to achieve; in fact, it’s as easy as the click of a small button. This winter, the Big Bang ‘One-Click’ gets edgier, with an oversized black leather cuff strap enhanced with soft Orylag® rabbit fur in mottled grey, electric turquoise, or fuchsia, with matching stitching on the strap. The Cuddly Cuff is adaptable to the Big Bang 39mm One-Click watches. Our favorite? 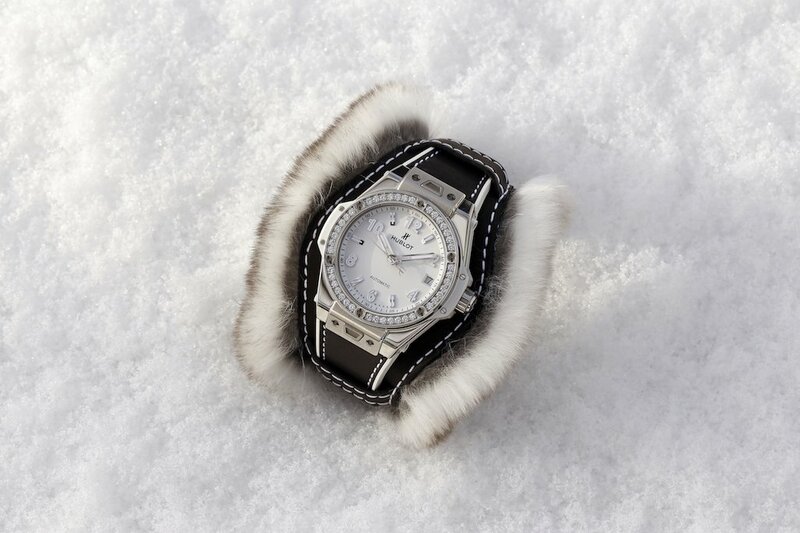 The 39mm Steel Diamonds attached to the mottled grey fur Cuddly Cuff, with its original black strap or even a white strap. We can see these models strutting down the ski slopes! The brand of firsts succeeded once again in proving that no trend, no style, no design, no material are too far-fetched or tough to translate into a watch. With Hublot’s partner Ferrari celebrating their 70th anniversary this year, we can’t wait to see what the watchmaker and the carmaker are coming up with at Baselworld!